Public Protector Busisiwe Mkhwebane says Finance Minister Tito Mboweni was incorrect in defending National Treasury director-general (DG) Dondo Mogajane, by saying that he merely failed to disclose a traffic fine when applying for the DG post. Mboweni was speaking at a media briefing ahead of his 2019 budget speech. He said his department supported Mogajane and that he would take Mkhwebane’s report on judicial review. However, the Public Protector says in a statement that Mogajane was convicted in a court of law and had failed to disclose this in his application – as required by law. 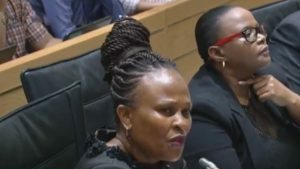 Mkhwebane says President Cyril Ramaphosa had announced he was taking action on the matter and she finds it strange that the Finance Minister appears to be contradicting the President. The post Mboweni incorrect to defend Mogajane: Public Protector appeared first on SABC News – Breaking news, special reports, world, business, sport coverage of all South African current events. Africa's news leader.. PREVIOUS POST Previous post: Could Lagerfeld’s cat Choupette inherit his millions?